Country-style ribs are the meatiest type and can be bought in individual servings or as slabs. They are cut from either the rib or sirloin end of the pork loin. These ribs are a favorite of those who like to use a knife and fork while enjoying their meal. Common rib recipes can be prepared dry or wet. Wet rib recipes are those that include basting with sauces while cooking, and should be generously brushed during the last half hour of cooking. Dry rib recipes include a mixture of herbs and spices. This mixture can be applied to the ribs just before cooking. Three delicious recipes of country style ribs in Oven are listed below. Have a look at and make by yourself, you must be enjoying with the fragrance from the oven. Tender, delicious ribs baked twice with BBQ sauce. Preheat oven to 250 °F/120 °C. Place ribs in a roaster or shallow baking pan in a single layer and add salt (optional). Spread garlic on the ribs, top with slices of lemon. Bake for two hours or until the ribs are tender. Drain. Bake for one hour at 200 °F. 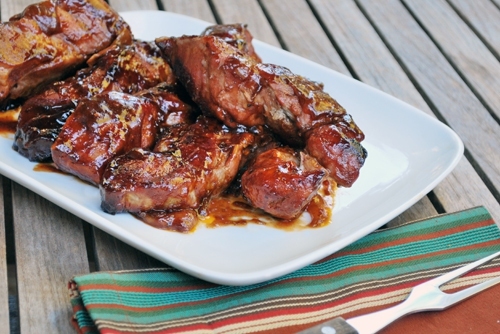 Tasty ribs with a homemade BBQ sauce that feature a spicy, citrus flavor. Place the ribs in a shallow roasting pan with the meaty side up. Place a lemon slice, an orange slice, and an onion slice on each rib. Bake at 450 °F for 20 mins. Bring the remaining ingredients to a boil in a medium saucepan, and then pour over the ribs. Bake for one hour at 350 °F, basting often. This easy meal is slow braised for tender, tasty results. It tastes great with boiled or mashed potatoes and vegetables on the side. Preheat oven to 300°F/150 °C or Gas 2. Sprinkle salt and pepper onto the pork ribs. In a large Dutch oven, heat 2 tbsp. of the olive oil over medium heat. Add the ribs and sear each side. Place the seared ribs on a plate until later. Add the remaining olive oil, and the onion, carrot and celery to the pan. Cook and stir until the onion appears lightly browned and translucent. Place the ribs back in the pan. Mix the apple cider vinegar, tomato paste, and chicken broth in a bowl. Add the thyme and bay leaves and pour the mixture over the ribs. Cook, covered, for 3 hours or until the ribs are tender. Remove the bay leaves and skim the fat. If thicker juice is desired, mix 2 tbsps. of cold water with 1 ½ tbsps. of flour. Simmer the skimmed juices and add the flour mixture. Cook until thickened, stirring frequently. Serve with boiled or mashed potatoes, vegetables and juices.